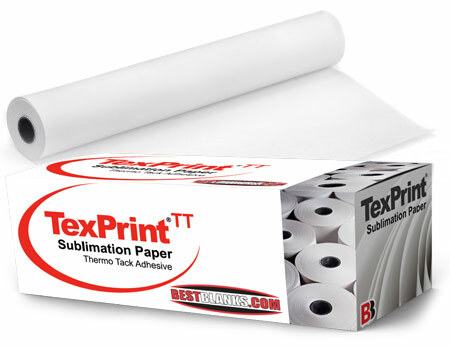 Adhesive Sublimation Paper for Apparel Applications - TexPrint-ThermoTack® dye-sub print paper is a middle-weight thermo-adhesive treated dye-sub print paper, designed to adhere to most textiles during heat calendaring. This feature eliminates ghosting and blurring issues during heat pressing. Recommended for use with all piezo-printers. ThermoTack is available in middle-weight (100 gsm) in a range of sizes from 91cm (36") to 1.82m (72"). Tackified Coating Chemistry provides a unique print medium engineered solely for apparel sublimation transfer applications, a tacky super-uniform coated print surface activates during the transfer process, high fluid capacity. Thermo-Tack paper maintains sharp definition even at heaviest ink loads, absolute color consistency, 100gsm base sheet for ease of handling right though the calendar machine, special length rolls are available upon request with quick turn-around. Compatible with most brands of digital sublimation inks, Roland, Epson, Mutoh and Mimaki printers and most polyester fabrics. Best output is attained with properly profiled integration.